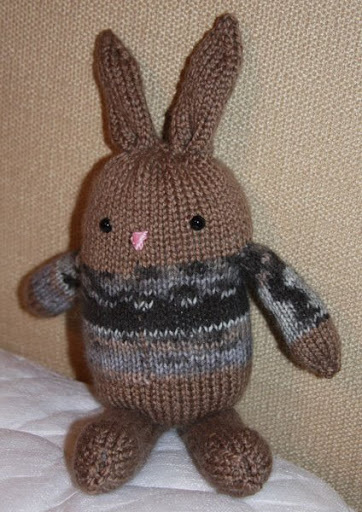 First, the bunny for My Bunny. I think it turned out rather well and the more of these I make, the better I get at putting noses on them. Still do not have embroidery skills to save my life, but they’re improving. 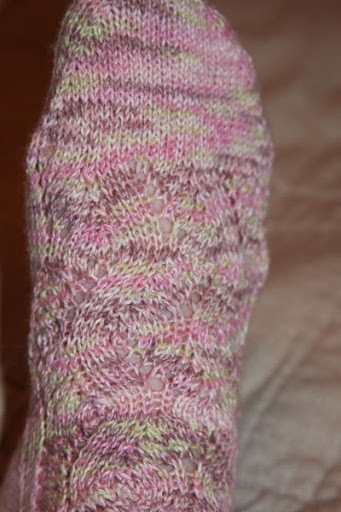 Tonight’s finished object is my Spring Forward socks, in TOFUtsies. At first the colorway reminded me of a washed out rose-themed color scheme, but upon closer inspection and thought, I realized it reminds me more of those fruity mini-marshmallows I used to eat as a child. Pattern is really easy to memorize and enjoyable and the yarn seems to work well for it. I’m not sure why TOFUtsies always allows me to make the foot of my socks shorter, but it does. Oh well, they fit and that’s what counts. Next I believe I’ll be moving onto a birthday present for my sister so it’s out of the way and then onto that larger sausage dog for my son. I have other things I want to blog about, but am lacking the focus to do so tonight. So this entry will be short and to the point.